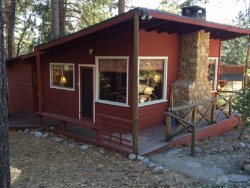 This large family friendly cabin is located in Pine Cove, just a short distance from the heart of Idyllwild. It is nestled among beautiful pine trees on a corner lot with plenty of parking. The large fenced yard is perfect for kids to run, play, and explore the beauty of Idyllwild nature. There is an outdoor deck that where you can enjoy a bar b q on the picnic table or relax with a glass of wine while watching/listening to many types of birds, squirrels, chipmunks, and possibly deer. The gentle evening breeze of Pine Cove makes every afternoon perfect. Inside, on the main level, there is a large kitchen and dining room with high chair. High end appliances and all the comforts of home, make cooking a breeze. Just off the kitchen is a lovely living room with cozy wood burning stove, toys for the little ones, and very comfy furniture. Down the hall you will find a full bath and two large bright bedrooms. The master has a queen sized bed and the second has bunk beds with a twin on top and full mattress below. This home is beautifully decorated! On the upper level there is a huge family room with family games, sectional couch, tv, and even a secret playroom for the kids loaded with toys, books, videos, and fluffy carpeting perfect for doing puzzles or just lounging away from the parents. They'll enjoy their own little "fort" while still in eyesight. This room also has a very comfortable queen sized bed and washer dryer. Now has Wi-Fi and is pet friendly.